Pat O'Sullivan has stated he wants to stay there. If it's not financially viable then their hand will be forced, in which case it's off to Jackman Park. That's all up in the air as far as I can see. Pat O'Sullivan would obviously want to stay in the Market's Field, but I can't see how the club can afford it as things are. Moving to the cheaper option of Jackman - which despite some people opinions, isn't really all that far off MF's level as far as I can see - as a First Division home would make sense, unless the powers that be behind MF climb down. But new investors/owners would change things. Do Limerick FC or LEDP own the away stand? If that was placed alongside the current stand in Jackman sure it'd be equally as good as MF. Jackman is a dreary and miserable place. Honestly, I don't think Markets Field is a whole lot better. It's got a great main stand, and obviously handy corporate facilities, but the rest of the ground is open and miserable, only with a pop up stand thrown in for good measure. Jackman has the same grassy hill as the Popular side of Markets Field, one main stand, and is really handy for public transport. It would also be a hell of a lot cheaper to rent. Market's Field has, as stated, some advantages over Jackman, namely the bigger home stand, bigger away stand (with a separate entrance), the corporate facilities, a paved way across to the grassy bank, better dressing rooms (I think). The pitch has had its ups and downs, but I would say for most of our time there it's been better than the constantly bobbly Jackman equivalent. And the sentimental aspect is not immaterial either. But there is the cost to consider. The crowds in the First Division will not be great, a separate away entrance is not required. Penny's need to be pinched. And while brinksmanship is a dicey prospect, it might be no bad thing to let those behind the Market's Field to have their stadium without a primary tenant for a while. I am not sure that is true. I think we were being screwed for rent there also...no love lost between Limerick FC and the local league. Jackman if I remember right was between €500-700 per match. Markets Field is closer to €2,200 per match. Jackman now has two entrances and the dressing rooms have been extended. Oh, fair enough, I got that wrong. Simple enough - project your likely crowds and see which location best fits financially with the business. I suspect 2,200 rent for a first division game is unrealistic. can think of better ways to spend the cash (like getting players in to win promotion). Any truth to the idea Sean Connor is being brought in as manager!? haven't Limerick fans suffered enough ? Hasn't Sean Connor suffered enough? The club has announced a "consortium" will back it financially this season, until a "mutually agreeable take over" later in the year. Who knows what that means practically. Sounds like some positive news. Im assuming that the consortium bankrolling thing for this season will be the same group looking to take control in due course. In practical terms at the very least it should mean no docked points for financial issues. It's certainly better than having an owner who is cutting funding and looking for an out as we experienced at Dundalk no so long ago (and yes hopefully never to happen again!!). With the LEDP(?) 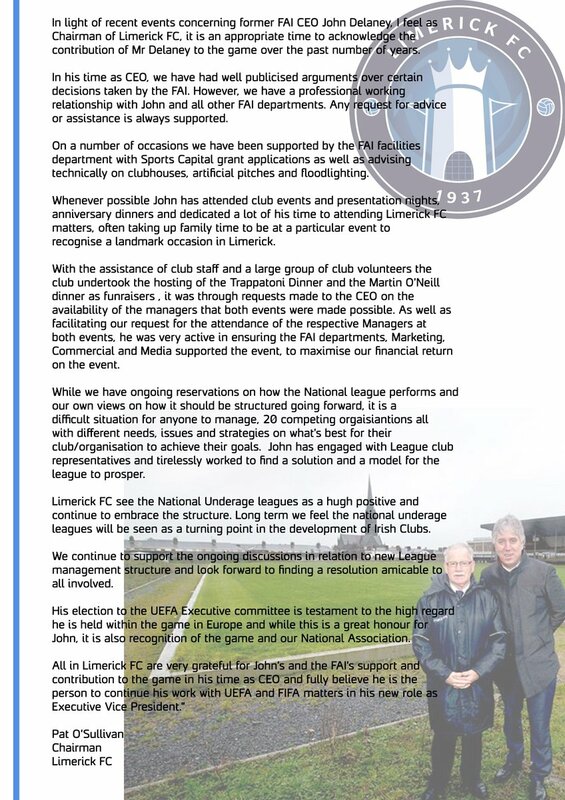 coming to an agreement to continue allowing Limerick use Markets Field what could have been a total disaster for the club, well maybe they have gotten just over the crest of the hill!?! Last edited by Nesta99; 11/02/2019 at 7:59 PM. Why would they not just take it over in the short term? Is O'Sullivan still clinging to control? Hope this works out but its a strange situation. Main players are Tommy Daly and son Jamie. Don't know much about them myself, aside from them owning a car sale business and being involved in junior football and Moyross community groups. Hopefully it's a proper turning point and not another false dawn. The Town players will be wearing ‘We Love John’ t-shirts for their warm up tonight. Reports of a “John 360k - that’s AOK!” banner also. That would be brilliant, honestly.